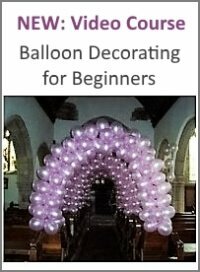 How To Make an Anchor with Balloons? To make the bottom and top of the balloon anchor, could I use fishing line? 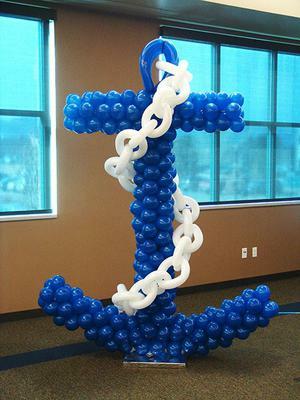 To make this type of balloon anchor sculpture, you would have to create a frame first. For the middle pole you could probably use PVC conduit, as we show for the balloon column base. For the bottom and top part of the anchor I would recommend to use aluminum rod, bent into shape for the anchor bottom. 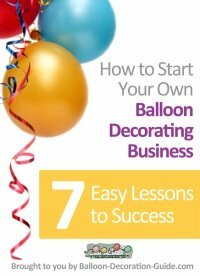 I found a nice step-by-step video for a balloon anchor by Sandi Masori. The design is a bit different from the photo you uploaded, but the principle is the same. She makes the frame completely out of aluminium rod. Comments for How To Make an Anchor with Balloons? 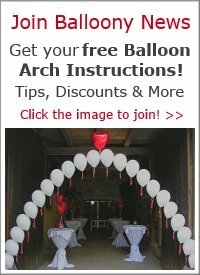 Find the middle of an uninflated 260Q and tie it to the neck of the center of the balloon cluster to be placed at the end of the anchor top or bottom. Then tie the ends of the 260Q together forming a rubberband. Now put the cluster in place and pull the 260Q down about three or four balloon clusters and pop over one of the clusters. The tension should hold the end balloons in place nicely. Silly question but how do I get the balloons to stay attached to either end on the curve bottom part of the anchor and the top horizontal part? The anchor is made of blue 5 inch round latex balloons. 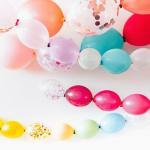 The white long balloons could be 260Q or 350Q - they look thicker than the 160Q type. The yellow balloons are 5" balloons, and judging from the look of it they are blown up to slightly different sizes. The dark blue ones are 11" balloons blown up to 10" and 8". And the white ones are probably 9" (blown up to 7") and 5" inch balloons. What size balloons are used for this anchor.